ABOVE: A postal bus follows a mountain road near Beatenberg in the Bernese Oberland. Bus travel may not be as glamorous as electrified railways, funiculars, and aerial cablecars, but it represents a vital link in Switzerland's tightly integrated public transportation system. After all, not every town or village can be on a railroad line--especially if it's halfway up a mountainside or tucked into a corner of a remote valley. The Autobus volume of the Swiss Official Timetable has more than a thousand timetables for bus lines throughout Switzerland, including many Postal Bus routes operated by Swiss Post. These bright yellow buses, with their triple-redundant brake systems and distinctive three-tone horns, are seen all over the country. Look for them at train stations and post offices, where local citizens use them for commuting, visiting Grandma, or heading for town to buy the latest Metallica album. Route 950.50 follows the eastern arm of Lake Lugano, skirts the upper leg of Lake Maggiore, and cuts through Italy on its way to Tirano, near the border of Switzerland's Canton Graub�nden and the Italian Alps. From Tirano, you can catch a bus or train to Pontresina and St. Moritz. This route operates daily from June 1-Oct. 19 and on Saturdays and Sundays during the rest of the year. Meiringen is a hiking and mountaineering resort in the Bernese Oberland; the nearby Reichenbach Falls were featured in a Sherlock Holmes novel. The bus route follows a narrow road over the Sustenpass (elev. 7,363 ft.) to G�schenen, a stop on the main railroad line between Z�rich and Italy. Several other departures cover the Meiringen-Susten leg of the journey, and the buses shown above haul bicycles between Meiringen and Susten. NOTE: This route operates only from June 21-Sept. 21. 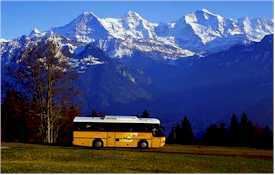 Switzerland offers a variety of special transportation tickets for tourists. The most convenient are the Swiss Pass and the Swiss Flexi-Pass, which allow unlimited travel on the Swiss Federal Railways, postal buses, lake steamers, and urban transit systems for a specified number of days. With a Swiss Pass or Flexi-Pass, you can travel just about anywhere without having to do a pantomime act in German, French, or Italian at every local ticket window. The official Swiss Postal Bus site has travel suggestions, excusion offers, timetables, and more. This fill-in-the-blanks journey planner is geared toward rail trips, but it includes bus connections where appropriate. My illustrated article describes the Offizielles Kursbuch, a compendium of rail, bus, boat, cable cars, and other transportation services throughout Switzerland. Photo: Copyright © Switzerland Tourism. Used by permission.